Thailand is an easy country to love. A popular part of that land is Phuket and there is more to that region than just its glorious beaches. Any visitor would miss so much if they didn’t take a little time and a little tour. A half-day Phuket City excursion will show another and more traditional face of Phuket. Downtown Market is a must-visit for any food-loving visitor. It is one of the oldest fresh markets in Phuket and usually open all day and every day. One finds it off the Ranong Road, diagonally opposite Talad Sod Satarana. 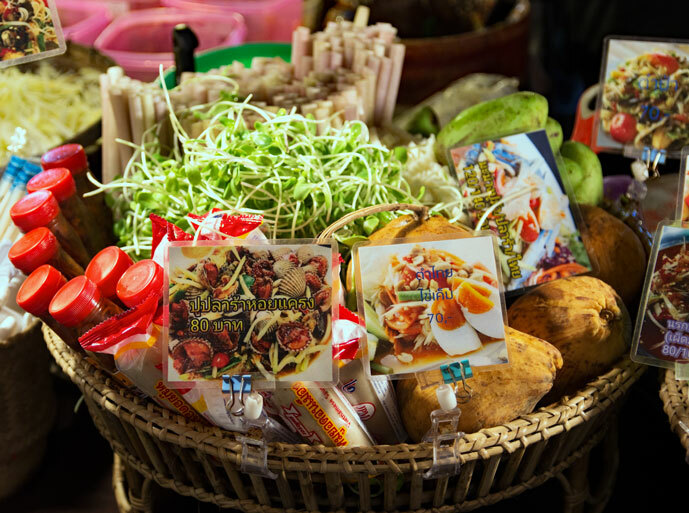 It is all here in this quintessential Thai market: Asian vegetables, meat, fresh fish and seafood, and exotic fruits. There are also bags and bottles of local condiments and sauces, as well as ready-made dishes. The lemongrass can be seen in huge bundles of metre-long stalks! Bananas come in every size and colour. Dried fish is gift-wrapped. This is a beautiful old Chinese shrine, but easily missed. It was built over a hundred years ago in 1891. 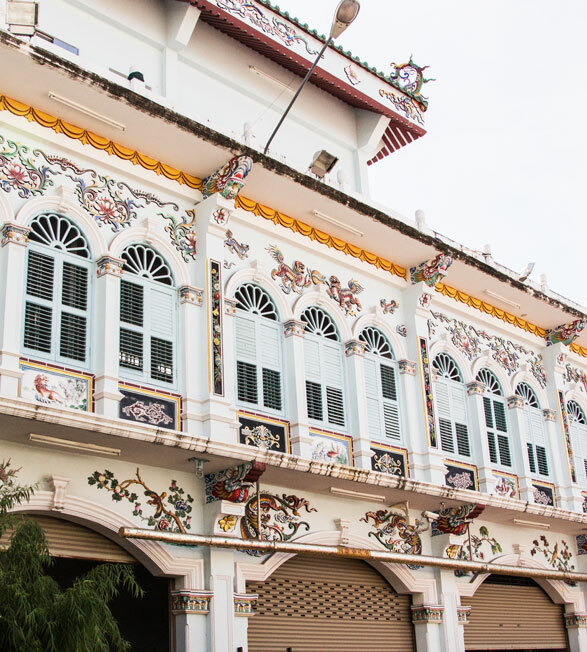 It is found in a narrow lane on Phang Nga Road, and was built to house deities who were worshipped by families of men who had originally been immigrants from China. Colourful and dramatic, it offers great photo opportunities to respectful tourists – remember this is, after all, a place of worship, and was here a long time before anyone invented an iPhone camera. The architecture of the shrine is in traditional Chinese style, with the dragons and dolls that were popular as decorations in Hokkien Province. This extravagant building is well worth a visit. This is perhaps the most famous temple in Phuket and is popular with local Buddhists as well as tourists from around the globe. Here one finds a statue of Luangpho Chaem, who helped the people of Phuket put down the Ang-yee or Chinese Coolie Rebellion in 1876. 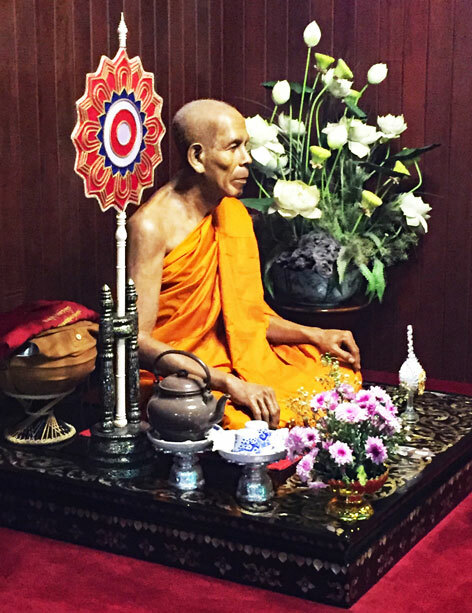 He is still so revered that visitors continue to ‘rent’ amulets bearing his likeness to bring luck, safety and good health. The temple buildings are magnificent and just what one would hope to find when visiting Phuket. The craftsmanship and attention to detail is wonderful. There is a tower in which fire crackers are lit. The sound of these loud explosions reverberates throughout the site. Another part of the intriguing theatre is quieter: watching the devotees apply real gold leaf to stone effigies, and offering lengths of cloth and lotus flowers. It is worth taking a little time to sit silently, and reflect. Big Buddha is, unsurprisingly, the largest Buddha on Phuket island, being 25 metres wide and 45 metres tall. The temple is indeed an impressive landmark, and can be seen for miles around. Thousands of small white marble tiles cover the huge figure. One can purchase these tiles to help support this project. One can write a message on the back of a tile which will soon become part of the fabric of this statue. One finds trees covered with metal leaves also bearing messages and wishes, and one can make donations by leaving coins in monks’ bowls. Lock Tien, Phuket’s local food centre, shouldn’t be missed. It is a chance for visitors to enjoy a restaurant frequented by locals, and that is always an indication of quality and authenticity of dishes. I could happily eat my way through everything on the bi-lingual menu here …and I almost did! Loba is made from the pig’s head, ears, tongue and intestines, simmered in aromatic Chinese five-spice and soy sauce. It might sound challenging, but it really is a delicious plate that does not taste one bit offally. This dish comes with deep-fried tofu and pork belly and Chinese sausages, along with a tangy tamarind-chilli dipping sauce. Por Pia Sod is spring roll and they make it fresh here. This one comes with a spicy or mild sauce. Order the spicy version, as it is for which to die. 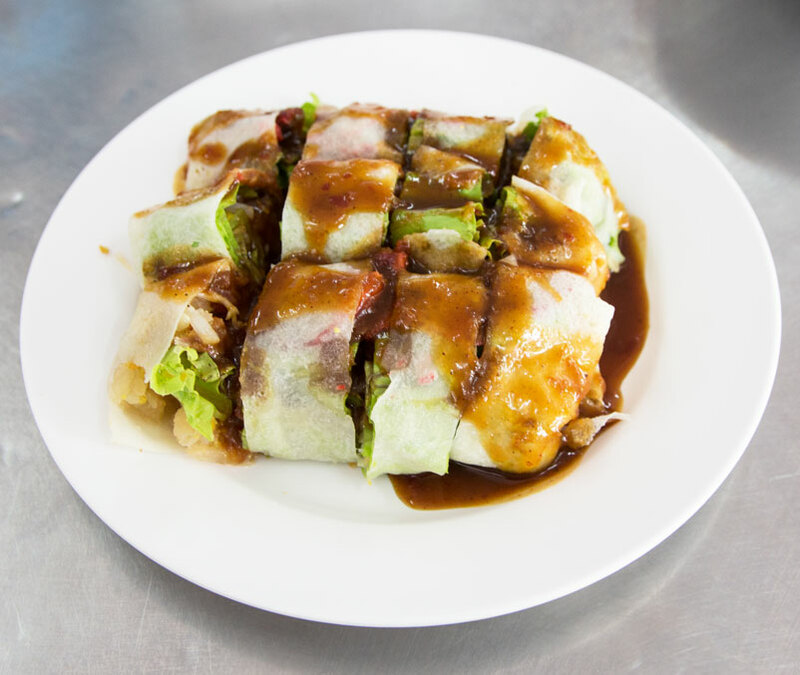 These spring rolls are a speciality here. A large portion of this alone constitutes a satisfying meal …but it would be a shame to miss some other flavoursome menu items. Oh Aew is a chilly show-stopper. This icy dessert is made on an ancient ice-shaving machine at the front of the food court. The confection is a sizable bowl of ice, jelly and fruit with a syrup poured over the snowy peak. What could be more welcome at the end of a well-flavoured meal of gargantuan proportions? Great value for money, too. Phuket Sunday Walking Street Market (Lard Yai) in Old Phuket Town should be on every visitor’s itinerary. This colourful weekly market is held on the architecturally fascinating Thalang Road, in the centre of the historical Sino-Portuguese district. One will discover typical southern Thai food specialities that include cookies, pastries, fried foods and hot dishes. The aromas are mouth-watering. It would be totally impossible to stroll through this vibrant and lively street without tasting a little something here, a nibble of a small savoury there, perhaps a plate of steaming noodles on the left, and some fish on the right. ‘Come hungry’ would be my sage advice! Here’s a video of the Sunday evening Walking Market in Phuket Town. This weekly event is every Sunday from 4.00 pm – 10.00 pm.